Magali is one of a growing number of woman mechanics hoping to be successful in motorsport. She currently works for a Peugeot factory in China where she is in charge of building and fitting 1.3 and 1.4 liter engines for Peugeot road cars. In order to keep abreast of current engine technology, Magali spends the majority of her time in France working with the French engineers in their factory. She learns from the engineers and then takes this knowledge and implements the necessary changes to the factory in China. Currently, her factory is also undergoing the difficult process of sourcing parts locally for the first time to increase the economic efficiency of the Chinese operation. Aside from the ‘day job’ however Magali has been also been a key part of the WR race team for the past several years. Every Saturday that Magali is in France, she works on the WR car for the Le Mans 24 hours. All the mechanics on the WR team are volunteers and most hold down jobs for Peugeot outside of the race team. Magali admits that even though she loves her main job working with the Chinese factory, "racing is my true passion". She went to engineering school and it was there that she "fell in love with the atmosphere and environment of motorsport". In 1996 she experienced Le Mans for the first time when she was asked to deliver parts to the WR team as part of her job training program. Seeing the volunteer team in action, she recognized WR as a big chance to get involved with motorsport. 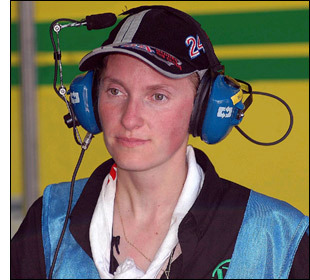 In 2000 when Magali had finished engineering school, she convinced a former WR race team engineer to let her join the team. Over the next few months Magali worked hard to "prove herself on the team" and gain respect from her other male mechanics and senior personnel. All of Magali's and the rest of the WR team’s hard work paid off in 1996 when the WR team finished second in their class (LMP 675). Since 2000, Magali has been a key player on the WR team and enjoys learning everything she can about motorsport. During race day she is in charge of preparing the racecar by making any last minute changes, and, throughout the race, she plays the vital role of team manager, speaking with the drivers both on and off the course, taking lap times, and organizing the other mechanics. However, Magali says her ability to "think like a man" has made her transition to motorsport easy and even though she does "lack the physical strength of a man" her mental capabilities compare very favourably! 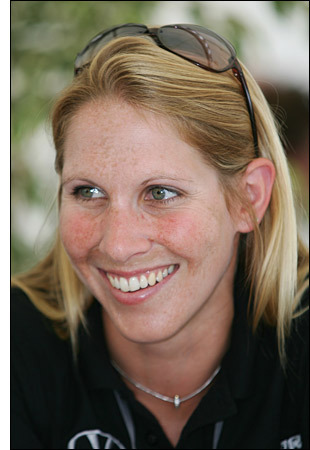 At this years Le Mans 2006, Liz Halliday was the only woman driver in the field. Liz of course competed last year too at Le Mans with Intersport Racing and lead her class but unfortunately the car retired before the finish due to mechanical problems. Liz gets her racing roots from her father who is a race instructor. At the age of 16, her father taught her how to drive a racecar and since then she has never looked back. At first Liz's mother was hesitant to let her only child race cars, but she eventually agreed. Now, both of Liz's parents support her as she continues her racing career but not everybody has been as welcoming Liz and her endeavours. At the beginning, it was hard for Liz because she felt like she had to earn the respect of the male competitors, and once she started doing well some "even accused me of cheating". However, she turned the criticism and her frustration into results, she became the first woman ever to win her class in the British GT Championship and scored some fine results in both the FIA GT Championship driving the GT1 Lister Storm and in Grand-Am aboard a TRG Porsche 911 before making the jump to the American Le Mans Series. “Driving in the ALMS is much more professional, intense, and requires more focus compared to club racing.” That suits her fine. She enjoyed being the only woman at Le Mans this year and perhaps surprisingly says that she "wouldn't ever want to share a car with another woman or race in a woman only league". She relishes the competition her male co-drivers and competitors provide, and of course her status as the only woman driver at Le Mans this year, did her no harm at all in terms of media attention. Liz admits that she probably feels more pressure to do well than other competitor because "everybody watches every move I make and when I make a mistake its a huge deal". However, over the years Liz has gotten used to the pressure and dreams one day to win Le Mans, and be a paid professional driver. Jules Boyce is well-known throughout motor racing for her behind the scenes work in organizing race teams for whom she "Arranges doctors and physios for teams and gets anything and anyone else that they need”. This year at Le Mans she was operating as co-ordinator for Krohn Green Racing for whom she arranged team doctors, and arranged hospitality. In addition she provided support for four other race teams throughout race week running errands that included ensuring that towels, drinks, and the other miscellaneous items that keep drivers and mechanics ticking over are where they need to be when they need to be there. She is the go-to person around the track and claims that she just "gets stuff done." Jules loves her job because she "I get stuff done, I work alongside some fantastic people and I have the freedom to choose the people with whom I work." She didn’t always see herself working in motorsport however. In 1996 she helped a friend out at a racetrack and "got to know everyone and got involved with a few bits and pieces." From there she got offered more jobs lending a helping hand. Organising doctors to help the teams is her first priority and she tries her best to provide moral support for her crew "because I figure they make way more important decisions than I make". When someone gets hurt Jules is the first person anyone calls and she responds by providing the medical team and the supplies they need. Women in motorsport can be overlooked or taken for granted but their contributions throughout a major event are essential in making teams (and the event overall) successful. Their numbers are still fairly small but increasing all the time helped in no small part by the examples set by women like Liz Halliday, Magali Dessenne, and Jules Boyce who equal or surpass their male peers.